. Elegant 1920s wrought iron double sconce. Very nice pair of 1920s sconces with original polychrome detailing. 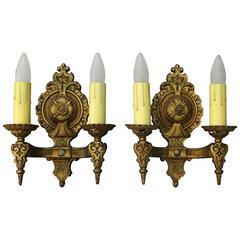 Measures: 10.5" H x 9" W x 3.25" D.
Pair of 2-light wrought iron sconces with gold highlights. Wired and ready to install. In working condition. Two pair are available for purchase if needed. Pair of grand six-light Spanish wrought iron sconces. 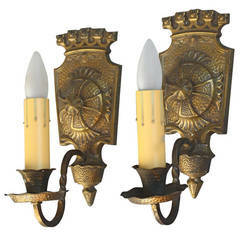 The pair of sconces has been newly rewired with drip wax candle covers and are ready to install.